THIS IS A MUST-SEE UNIT!$1,000,000 VIEW. St Louis Basilica, St. Louis SKYLINE, The Arch, Stan Musial Bridge, Fireworks, Sunrise, Sunset Even the rain is engaging. 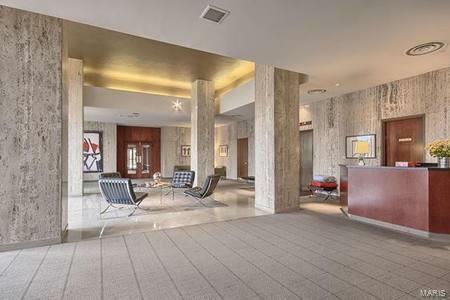 Glass Suite in the sky.High-end renovated 8th floor condo in Lindell Terrace, one of St. Louis' premier mid-century buildings designed by renowned HOK architect, Gyo Obata. This stunning, stylish and sophisticated condo was originally two bedrooms and can be easily re-converted. The new configuration creates an upscale loft appeal with an open concept kitchen with Bosch appliances, dining and living area for the ultimate CWE living experience. The master includes a generous closet and en-suite full bath. Entertaining is a dream. A private balcony is perfect for watching the sunrise or grilling outdoors. 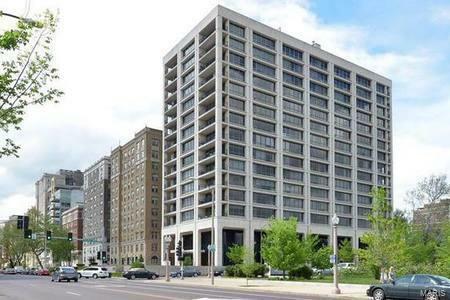 Building amenities include 24/7 security attendant, on-site manager, newly renovated exercise room, laundry room, bike storage and underground garage space. Listing provided courtesy of Mbl Realty Corporation. Listing information © 2019 Mid America Regional Information Systems, Inc.